Liberal trailed Guymon 19-8 after one quarter before using a 34-4 run to bust the game wide open. 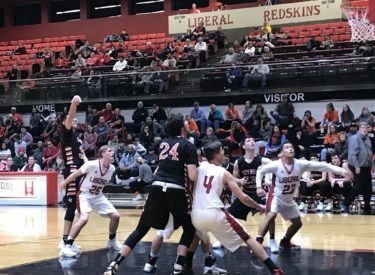 Liberal defeated Guymon 67-33 Tuesday night in the Big House for their eighth straight win against the Tigers. Guymon came out guns a blazing in the first quarter to lead 19-8. LHS used a 17-2 second quarter to lead 25-21 at halftime. LHS led 50-28 after three. The Redskins shots 57 percent from the field while GHS shot 30 percent. Kace Vongsakda scored 15 while Tristen Bigham had 14. Lee Hatcher sparked Liberal’s second quarter run and scored eight. Liberal last lost to Guymon at home in 2002. The Redskins are 6-9 and Guymon is 5-14. Liberal hosts Hays for homecoming Friday night at 7:45 on 1270 and kscbnews.net.